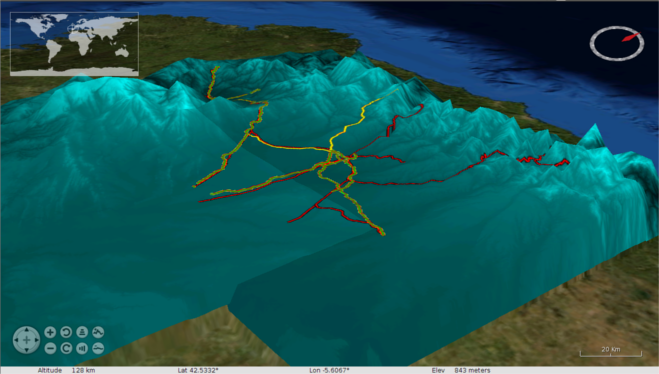 gvSIG is a Geographical Information System in free software, that is, a computer application aimed to represent, edit, analyze and manage information from the point of view of spatial relations. The gvSIG licence is GNU/GPL v.3 which gives the user the rights of free use, study, improvement and distribution. The gvSIG firts version was born in 2004 within a project that consisted in a full migration of the information technology systems of the Generalitat Valenciana in Spain (Valencian Regional Government). Since 2010, the project is managed by gvSIG Association. Developed under the values of collaboration and sharing knowledge, gvSIG has evolved very quickly and in a few years it has become one of the most used applications to manage the geographical information. What can we do with gvSIG? gvSIG is a sophisticated Geographical Information System and, as such, it is used to do every kind of work related to the territory management. If you are curious about the different gvSIG uses, don't hesitate to visit the website for cases of use. To represent data spatially. 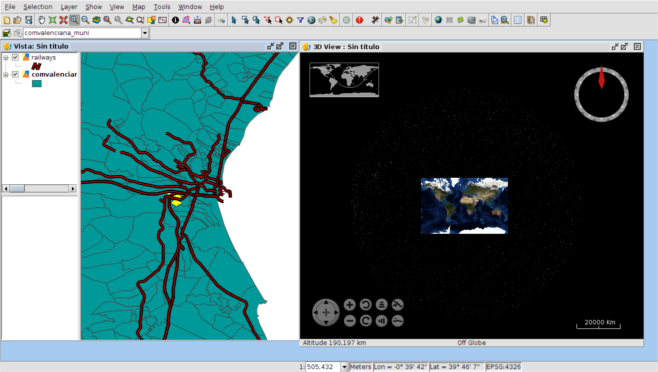 gvSIG allows you to open all format types (vector and raster; archives, databases and remote services) and represent them spatially in the different coordinate systems. You can apply all kind of legends and labels to represent your data. 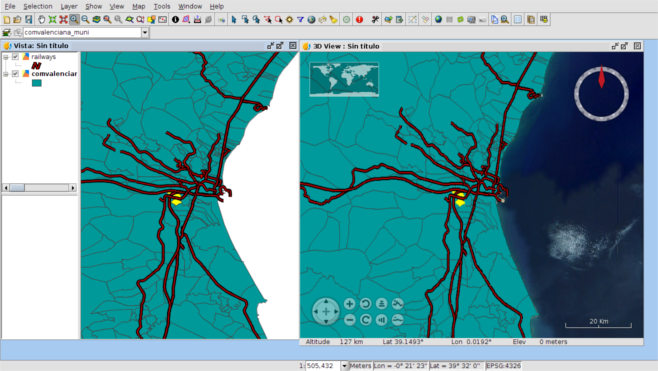 To design maps to print, gvSIG has tools to easily design maps, allowing you to add all type of cartographic elements and offering different options to print and export your new map. Edition. 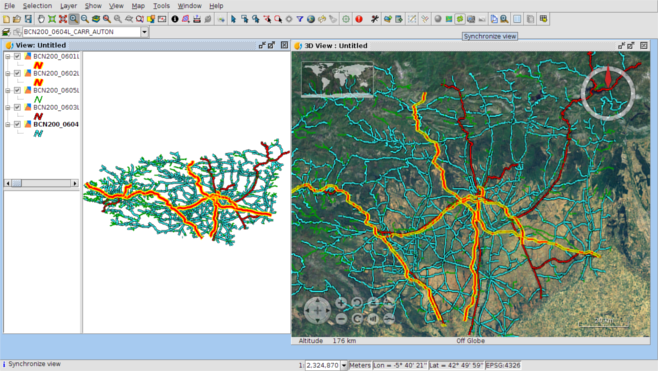 It offers a huge range of tools to edit either cartographic data or alphanumeric. Analysis. gvSIG has tools to facilitate the analysis of the existent data, either cartographic or alphanumeric data. More than 300 geoporcessing tools ara avaliable in gvSIG. And now we can work with 3D views!!! 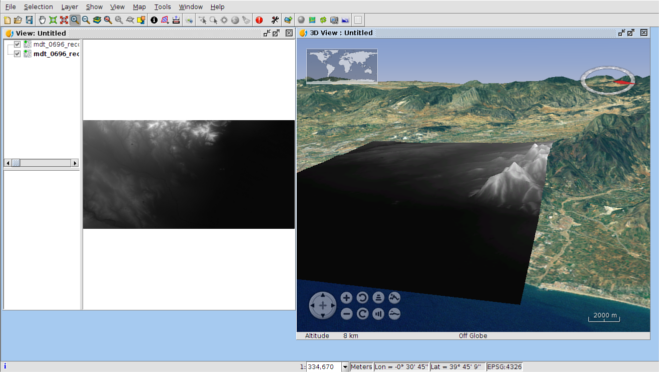 3D View is a plugin for gvSIG 2.2 based on NASA WorldWind SDK that allows users to create 3D views from gvSIG 2D views. 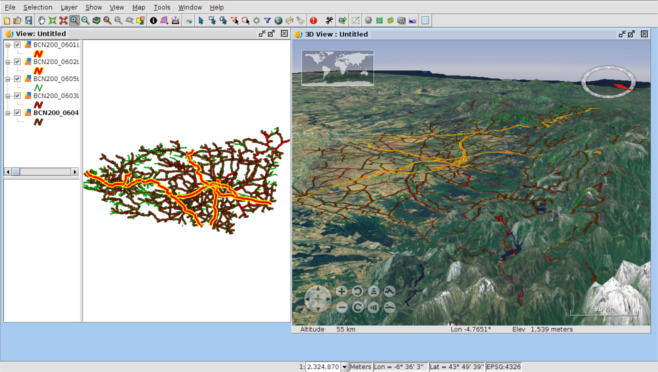 3D View plugin is compatible with all vector and raster formats, data bases and web remote services supported by gvSIG Desktop. 3D View manages a detail level structure and tile generation in order to load high resolution layers with no loss of performance. Moreover, 3D view plugin allows users to indicate loading paramaters in order to customize the detail level structure of 3D layers. 3D view plugin rasterize vector layers to load it in 3D view. This permits to load vector layer with any symbology or labeling. 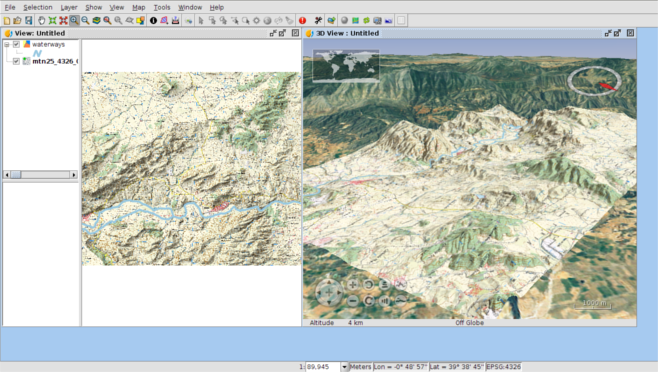 3D view allows users to load high resolution raster layer at 3D view. 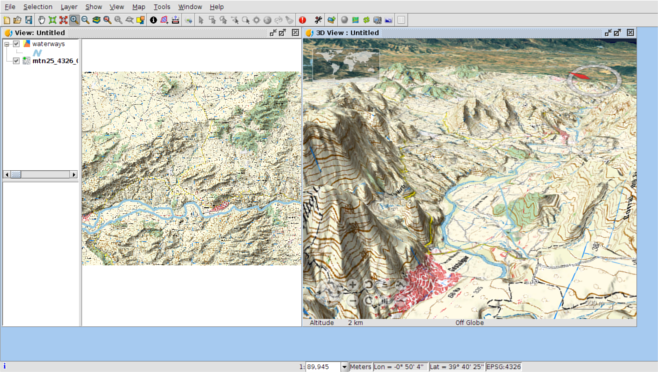 If raster layer has color tables, 3D View will apply it at 3D View. 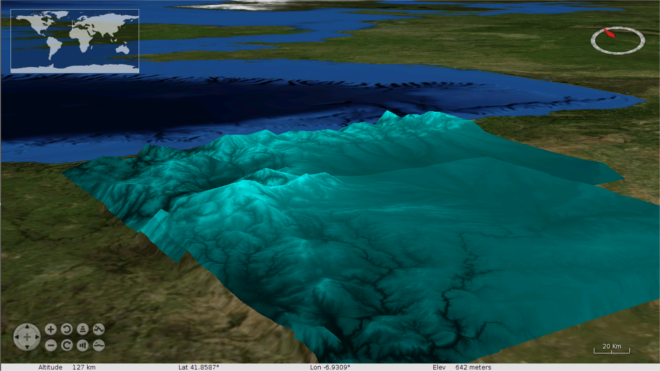 3D View plugin permits to load their own Digital Elevation Models (DEMs) from raster layers however, 3D View plugin already has a Digital Elevation Model (DEM) as base elevation. DEMs loaded by user can be added to base DEM without problems but if the user prefer to show only its owns DEMs, he can disables it. 3D View permits register 2D changes to copy them to associated 3D view. This allows users to view in 3D all changes done at 2D view. Plugin can copy at 3D view symbology changes, layer addition, layer deletion, order layer changes, visibility changes... The synchronization of changes can be manual or automatic. 3D View plugin can register viewport changes of 2D view to copy them in 3D view. This permits to synchronize viewport of 3D view and viewport of 2D view. The viewport synchronization can be manual o automatic. 3D View plugin permits to display one 3D view in full screen. 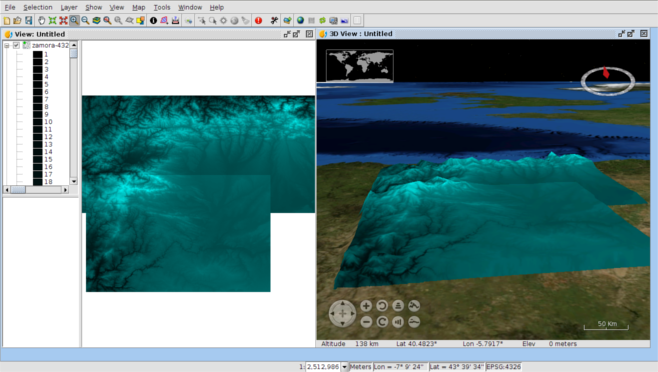 Important: in order to install the 3D View plugin is necessary to have installed a gvSIG Desktop version equals or greater than gvSIG Desktop 2.2. You can get it here. The next video shows how to install binaries from online repository.